Look first at the Canadian Library and Archives’ history of the “Black Robes”, or Jesuit missionaries among the Native Americans, which contains a description of the Jesuit Relations, or collection of correspondence between missionary priests and their superiors in Europe, and its purpose. Jesuit mission territory extended far beyond modern-day Canada and New England to include the entire Great Lakes region, the Mississippi River valley, which the French explorer Louis Jolliet and his companion Father Jacques Marquette traversed in 1673, and present-day Louisiana, Illinois, and Iowa, just to give an incomplete list. The history of French Jesuit missions among Native Americans is vast and complicated, and these documents only scratch the surface. A relatively small number of missionaries, single-mindedly dedicated to winning converts for Catholicism, traveled great distances and interacted with many different Native American tribes and ethnic groups. The French missionary style echoed the style of France’s rule over its colonial possessions in general, since French settlers never immigrated to the New World in the numbers that English settlers did. For the most part, France kept control over the large swath of territory nominally in its possession through the work of a few travelling missionaries and fur traders, as well as through a network of loyal Native American tribes. 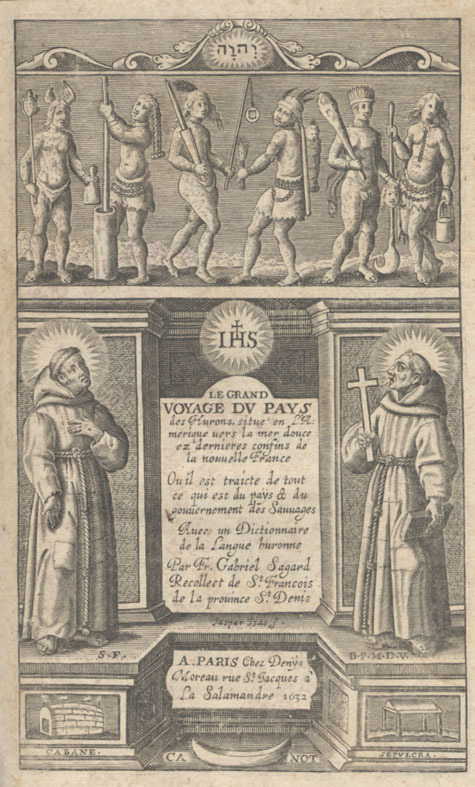 Even when they were welcomed by friendly tribes, Jesuit missionaries risked torture and death if they should happen to be captured by a rival tribe, a fate which overtook St. Isaac Jogues and St. Jean de Brebeuf, among others. Isaac Jogues capture and suffering is spoken of in some of these Relations, and Jean de Brebeuf authored several others. The Jesuit priests were conscious of the overwhelming scale of their task. As Father Paul LeJeune observed in 1639, “How much time and trouble in France is necessary to convert a single heretic, or, indeed, any Sinner, young or old? Ah! What is that in comparison to the conversion of a whole world, earthy and brutal to the last degree, grown old in its errors and superstitions during so many centuries? We find ourselves here as if in the midst of a sea where a million persons are drowning…” In many of the missionaries’ writings, we find the paradox that the Jesuit priests seem to have honestly cared for the spiritual well-being of those they ministered to, while at the same time their attitude towards Native American culture can be condescending, as they speak of rescuing Native Americans from sin and error. These documents are fascinating examples of the challenges of cultural exchange, as the Jesuit authors struggle to distinguish that which is merely different from that which is bad or evil. Sometimes the early missionaries were very careful not to offend cultural mores, as in a 1637 letter from Fr. LeJeune which cautions all missionaries not to make the “Savages” wait for them when embarking in the morning, to never show distaste for any of their customs, and to help out during portages, or over-land journeys, from one river to another. In fact, it is difficult to categorize the Jesuits’ actions from a modern point of view, although their dedication to their mission shines through all these writings. What features and sights do the missionary priests observe in the new land other than the customs and appearance of the Native Americans themselves? Could they be classified as explorers for their interest in the landscape and geography, as well as missionaries? Which Native American customs do the missionaries approve of? Which do they most disapprove of, and why? Which customs are Native Americans most resistant to giving up when they convert to Christianity? Why is it difficult for the missionaries to learn the languages of the Native American tribes among which they work? Do you think the difference in language might have affected the version of Christianity which the Native Americans received? Which concepts and ideas were especially difficult for the missionaries to convey? How can the writings of Jean de Brebeuf and other Jesuit priests be compared and contrasted with those of a modern ethnographer or anthropologist, observing indigenous people in the present day? Why are the Jesuit priests so detailed in their depictions of Native American religious customs? What do you make of the Native American tribe with a flood myth similar to the one in the Bible? -Page on the Black Robes with long written contextualization and a few scanned pages from primary source documents. -Page from the same archives’ online learning toolbox/ exhibit on the explorers of the Mississippi, Marquette and Joliet. -Acadia, 1612-1614: an evaluation of very early Jesuit missionary activities. -Hurons, 1636: Jean de Brebeuf, future martyr, gives an account of Huron superstitions. -Hurons and Iroquois, 1642-43: mentions the missionaries trying to navigate the tensions between different tribes, as well as details of the captivity of future martyr Isaac Jogues. -Lower Canada, Crees and Louisiana, 1720-1736: interesting mention of a Native American tribe with a flood myth comparable to the Biblical one, as well as missionary efforts in Louisiana from a later time period.